→Bark, Lunge, Spin or Wait, Watch, Work? Bark, Lunge, Spin or Wait, Watch, Work? One of the most frequent questions we see is how to play with multiple dogs, or how to wait turns with your dog at training. I put together a series of six tips previously for Facebook and am now sharing them here for quick reference for you, along with a seventh tip! This is really a myth buster. Allowing your dog to lunge on leash and obsessively bark at other dogs running agility is NOT a necessary part of training a fast agility dog, or a necessary part of anything. This includes tying your dog up to a fence to go crazy while other dogs are training… not cool, not necessary and not so good for either dog! You may be scaring other dogs, annoying other competitors and teaching your dog to “target” dogs which can lead to a cascading list of re-directed aggression issues. 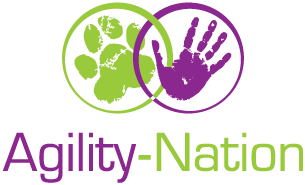 While you are training in agility ask yourself if what you are doing will contribute to your dog being a great family pet… remember, our dogs are only “agility dogs” for a small fraction of their lifetime with us! Tolerate the craziness… get ear plugs and ignore the barking / whining / lunging of one dog while you work another. This is ok if your dog’s behaviour doesn’t bother others, but likely it does! Manage the dog, so he doesn’t get a chance to rehearse the naughtiness. Likely this means putting him somewhere that he can’t see or hear you train another dog so he won’t want to bark. Train your dog to wait patiently for his turn on a raised dog bed, lawn chair or even in his crate. It would not surprise you that 3 is the option I choose. You can check out my blog on “Table Trading” for how fun, useful and rewarding this training is. Consistency is the key! Your training will be successful only if you prevent rehearsals of the naughtiness, and set your dog up for success with patient training rich in reinforcement. Training your dog to wait patiently for his turn to work can begin with a dog or puppy of any age. 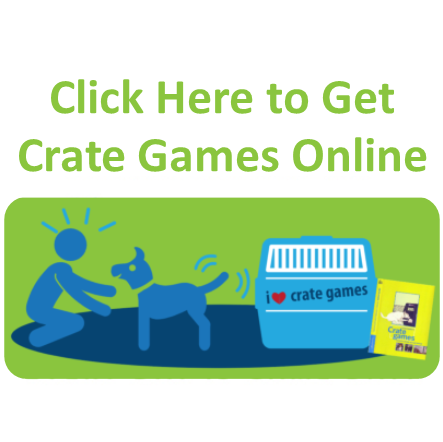 Start by building value for a crate (as described in Crate Games). Grow confidence while creating drive for your dog to want to hold control positions. Next, transfer that understanding to other ‘stations’ like a dog bed around the house, or a table, raised dog bed or lawn chair. Initially your dog’s job is just to hang out… alone or with others with or without you. Don’t rush this training. At first, just build a drive for the dog “wanting to hang out”. Value for a “station” is easiest taught with a Crate as you can close the door without personally interfering or “punishing” behaviour. From the dog’s point of view, it then becomes all about getting what he wants by making good choices! It is a fun game for the both of you. Protect your dog’s confidence. What are your expectations in specific terms? You cannot train what you cannot verbalize. In one concise sentence: What are you looking for from your dog? Where should your dog be? What should your dog be doing? How long should your dog be doing it? So many people think Criteria = The ‘Ideal Performance’ from their dog. In reality our “criteria” for anything our dogs do; for contacts, for their start line and for staying in a crate… is what it looks like when the dog puts in the LEAST amount of effort and WE accept it. This is why criteria at an agility trial so often looks very different than criteria at home. Clear criteria is not about your “ideal picture”, rather it is the “minimal” effort that you are willing to tolerate from your dog. We don’t have to “reward” it with a cookie… the environment is rewarding it. This is why the dog will continue to do it! Don’t state you want the dog to remain in a certain position unless you are willing to make sure he always does just that. Does what you think your criteria is, match what your dog thinks your criteria is? It isn’t good enough only to know what you want; you must also know what you don’t want AND what you will do anytime you see it. If your criteria is “stay in your crate” and you see your dog with only 2 toes in the crate… has your criteria been met? Reward what you see because you love it. Acknowledge what you see and allow it to continue. Stop what you see because it doesn’t meet criteria. Without #3 a battle begins between what you want and what you’ve allowed. This is the slippery slope people face in training anything… not just dogs! Allowing “it” once you means you are giving your dog permission to try it again in the future. “Sometimes” is “anytime” to our dogs. Remember that clear is kind. If you maintain your criteria you will not get frustrated, and when you are not frustrated, life is better for your dog and for you. The very best way to stop any annoying habit is to do your best to prevent it from happening in the first place. This can be accomplished in two ways. Ideal Rehearsals: Always move away from the training environment BEFORE he gets the urge to bark. Keep him in another room or his crate with a big bone to keep him busy, so he can’t watch or hear you having fun with another dog. Supervision and Reinforcement for Good Choices: Allow your puppy to watch the action only when someone is nearby to reward him for the good choice of being quiet. Move him further away from the action or out of the area if the excitement of watching gets him too anxious. Success has little to do with what we want and all to do with how we are able to change what the dog wants! For some dogs “just hanging out” in a crate or on a bench isn’t enough of a “job” to prevent them from barking while they watch you work another dog. Those dogs require an INCOMPATIBLE BEHAVIOUR… something the dog can do while watching that is incompatible with barking. If your dog loves toys, holding a toy in his mouth may be a good substitute. He can watch the action and learn to be patient waiting for a turn with you. Just like humans, dogs need to learn through successes. Grow the understanding in your dog of what you do want by “training” another dog while the first dog stays at his “station”. You are not really “training” the other dog, as the dog on the bed or in the open crate is the focus of your attention. This is a “real training session” not something you just do when it is convenient! Your goal is to not have the dog waiting his turn move beyond the threshold of excitement that he can successfully tolerate. Your dog will need good foundations prior to you introducing the other dog. Start with a low intensity activity with the other dog (such as just walking on leash). Stay close to the ‘waiting’ dog to ensure success but a distance from the distractions. Ping pong the distance away. Have a high level of reinforcement and a short required duration of holding position before you release the dog from his station to have a turn working with you. Visit my blog post “Distraction Work in Dog Training: A Conversation Between Friends” for how I set up my distraction training. Eventually, your dog’s ultimate reward for waiting is your release cue for him to come work with you! The tips above come from one of the popular in depth workshops we have in Agility Nation on working multiple dogs, where I show how we train our dogs to be quiet and relaxed when other dogs are working. Is waiting a life skill you have trained with your dog, or one that you want to train? Let me know in the comments. Today I am grateful for all the fun I have with my dogs when they ‘take turns’.